October 19, 2007 – The day my parents and I made the painful choice to move my Grandma Peterson into a nursing home. On October 19 (just over one month ago), my family made the difficult decision to move Jerry into a nursing home following her dispatch from Immanuel. Just weeks prior to her initial hospitalization, she was able to perform everyday tasks like cooking, changing channels on a TV remote, and playing cards. It was very shocking to me to watch her mobility deteriorate as quickly as it has. She is, at this time, on almost the same level as a paraplegic…unable to move her limbs, stand, walk, grasp, or even feel certain parts of her body. She is experiencing neck pain (I believe this is the primary reason for her surgery? ), headaches, joint pain, vision impairment, depression, etc. And the absolute most concerning thing to me is that her mind is beginning to unravel like her body…and this has only recently developed during her time in the nursing home. To my knowledge, she has never suffered a stroke or any other “qualifying event” that would logically result in such a rapid decline in her health and mobility. I understand that my grandma has lived many years and this may very well be just a natural effect of aging. But, keep in mind, that she was widowed over 30 years ago and had lived independently (with daily assistance from my mom) up until last October. I don’t expect you to magically turn back the hands of time and get her to where she was years ago, but if you can at all alleviate her pain and improve her quality of life, I will be eternally grateful. And if the surgery proves unsuccessful, I will mournfully accept the consequences but still thank you for the respect and attention you’ve given her. The surgery ended up working…or more accurately described…was deemed as successful as it could have been. We moved her from the initial nursing home – a place where she had volunteered for years, only to have been treated like one of the house plants she used to water – to a second nursing home. That second place initially seemed better than the first; honestly, it couldn’t have possibly been worse than the first. I visited her as much as I could. Sometimes solo and other times with my kids because I knew seeing me and her great grandchildren was what made her happiest of all. My parents made extra time, much more than I did, to tend to her needs. She had taken care of them and now it was their turn to pay that honor back. A month or two passed and grandma was making noticeable strides in terms of physical therapy and mental clarity. She had a tracheotomy wound that was healing and I remember buying her a package of colorful straws that I had planned to give to her so we could drink our beverages in style. We talked and laughed about rearranging her little room so she’d have space to dance. I remember answering my cell phone in January 2008 and hearing my dad on the other end of the line saying – somewhat agitated – that grandma had passed away. What? (But I was planning on giving her those straws.) What?! HOW DID THIS HAPPEN? I listened as my dad did his best to hold his voice firm, describing how he and my mom stopped in to visit with her only to find her halfway hanging off the bed. She had been changed earlier that day by a staff member who failed to re-position my grandma’s bed at the proper angle required for someone who had a tracheotomy. In essence, my grandma had been squirming with all the strength she could muster to find the call button because she was slowly suffocating. She never reached the call button. My mom, her daughter, made eye contact with her before she passed. My dad roamed the halls like an angry lion roaring at whomever was within earshot after realizing what had happened. Oh. God. You KNEW how much she praised you. How could you let these be her last moments on earth? My place of employment was incredibly close to the place where she died. I could have stopped by on my way home to check on her that day. It could have easily been me who either prevented this from happening or who witnessed her last moments. I’ve only experienced (what I assume was at the time) one panic attack my entire life. It happened in that first horrific nursing home. It happened because I feared my grandma was losing her will to live because the staff there was content to watch people do just that. And this second place ended up being worse than the first. A bushel and a peck. A bushel and a peck…and a hug around the neck. A hug around the neck…and a barrel in a heap. A barrel in a heap…and I’m talking in my sleep. 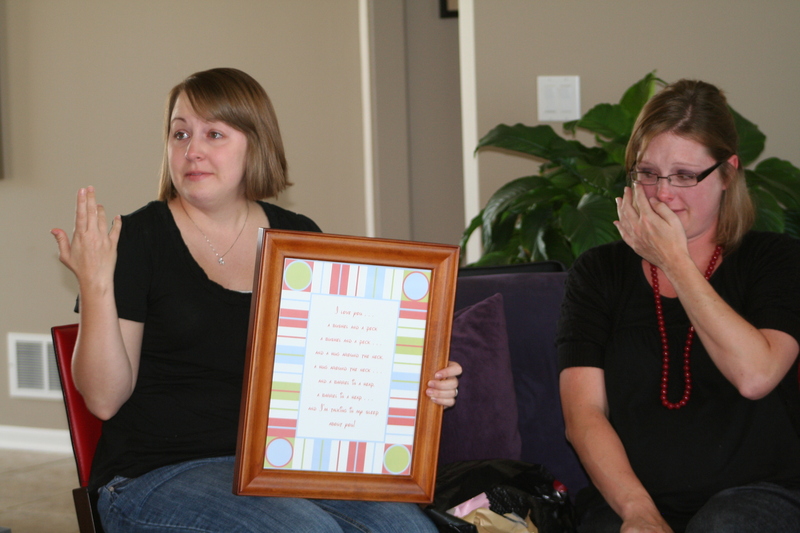 My friend, Melissa, helping me display the framed poem at my baby shower. 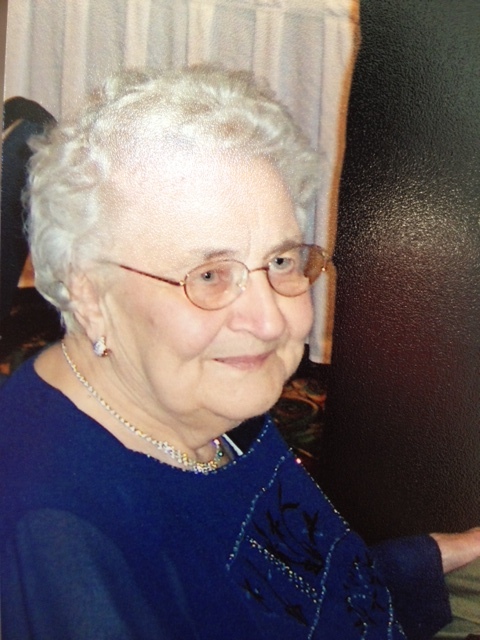 August 4, 2013 – The day I finally decided to write about my grandma. WHAT a beautiful lady. And I know from the way you speak about your grandma she was as beautiful inside as out. So proud of you for writing this, my friend. Thank you, Pam. Love you too. Of course I would love to share the photo. If you don’t mind, resend me your e-mail address (private message me on Facebook if you’d like). Thank you very much for sharing this. This is book marked — for when I find myself feeling important. I appreciate the kind words, Roy. I know how deeply you reflect on what you write so I am honored to hear you thought this was worthy of such praise. Wow, my heart breaks for you. You honor her now by writing these words. Not related to your post, but I just moved to Omaha and have been getting in touch with local bloggers. I’ve met up with a few and thought it would be fun to organize a local blogger meetup. Would you be interested? Thanks, Erin, for commenting. You can always keep me posted about potentially getting together. My e-mail address is hwpugs (at) yahoo (dot) com if you’d like to stay connected. Again, I appreciate you stopping by my site. Thanks, Al. Yes, it is sad. But she wouldn’t have wanted to continue living the way she was so I feel – after much time and reflection – that God knew better. One of my best friends gave me a framed quote shortly after everything happened that reads, “Don’t put a question mark where God puts a period.”That’s helped me get through the worst times.